Please call us at (425) 361-2265. 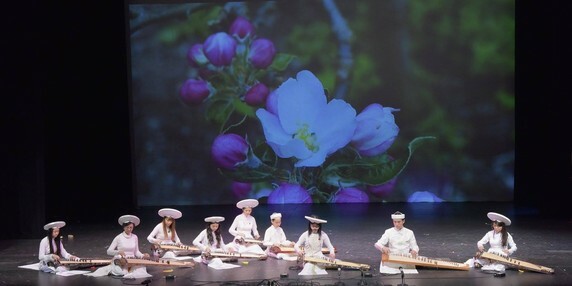 Please note: Huong Viet Performing Arts Group only performs at music concerts, charity events, and community festivals, when the music is played as a main focus without background activities. We do not accept invitations to perform at weddings, private parties, nor do we perform in casinos. Vietnamese traditional music today has diverged into two paths. One seeks to modernize traditional music by incorporation of the Western scale and adoption of Western or Chinese musical styles to produce a "hybrid form". Classical techniques are no longer emphasized and historical formats of each music region are neglected. In this attempt to revive classical Vietnamese music, as the root of the tree is weak, the resulting growth may still look lush but not altogether healthy. The other remains the traditional path, revitalized. This is the path followed by Huong Viet Performing Arts Group. We insist on mastery of traditional techniques as proper pressing and releasing of a note, different ways of vibrating a note, and following strict formats to play the music from each historical region. We seek the inner beauty, elegance, and spirit of traditional music. There is room to improvise, revise, even improve upon a solid foundation. The beauty that comes from the roots of one’s culture produces not only vigorous growth but also fragrant blossoms and ripe fruit. If you are looking for performers to play Rap, Pop, Chinese-style like, or Western music on Vietnamese traditional instruments; or those who use Vietnamese instruments with playback CD (a type of Vietnamese instrument karaoke type), then we are not the group you are looking for. Huong Viet Performing Arts Group is a 501c3 nonprofit organization. None of our teachers, members, performers receive any compensation. We are all volunteers. All honorariums are donated toward Huong Viet fund to be used to popularize and promote Vietnamese traditional music.